Gazza's tears in Turin....Thatcher ousted out of Downing Street....the Stone Roses playing their legendary Spike Island show....but which other seismic event happened in 1990? 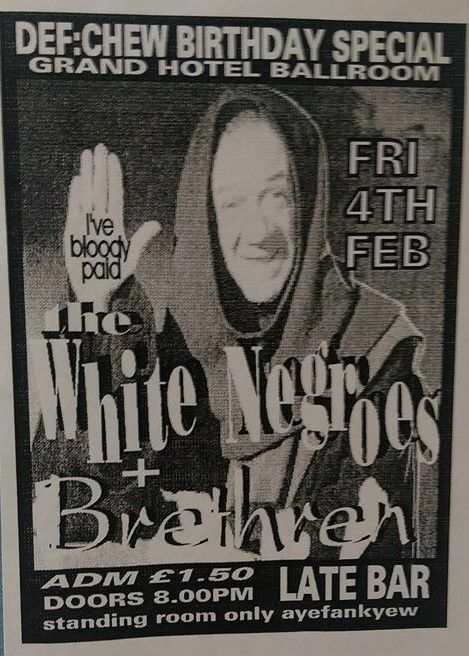 That's right the region's greatest ever live band, The White Negroes were formed and have rocked the region an all points in between for 25 years. Taking their name from Norman Mailer's seminal Beat essay, The White Negroes established a formidable live reputation with their celebratory shows. The Negroes pretty much became the house band at the legendary Cactus club nights at Middlesbrough Arena in the mid 90s, appearing on the same stage as the likes of Oasis, Ocean Colour Scene and the Stereophonics in the golden Brit pop era. The band came close to signing for Parlophone Records but famously put their head of A&R on a whitey when he came to see them perform live - and their 'unmanageable' reputation was sealed within the industry. Just as LA gave us The Beach Boys, and Dusseldorf produced Kraftwerk, so the post-industrial wasterland of Hartlepool spewed up The White Negroes. The band enjoyed several European tours but after 10 years of pills, thrills and bellyaches the boys took a much needed rest. The Negroes got back on stage in the mid-noughties, intensifying their awesome live repuation with memorable shows at Middlesbrough Music Live, Stockton Weekend, Willowman Festival, as well as their best show ever in front of 5,000 mental hometown fans at the Hartlepool Tall Ships festival. Described as 'stadium rock in a working men's club - like U2 on glue', the band infamously broke onto the set of kids TV show The Teletubbies, drunk all of The Stranglers rider backstage and lead singer Ish even ended up in the novel The Giro Playboys. The band celebrated their 25th anniversary and momentous occasion with some very special shows. The White Negroes "As good today as its always been"
GIBBO - Bass Guitar "Weighing in at 295lbs the undisputed heavyweight champion of the world"
GRASSY - Lead Guitar "The human dynamo of the stage, the pocket rocket of the electric guitar"
ISH - Vocals "The voice of a generation, the looks of Dyonisian god, the soul of a poet and the stage presence of a psychopath"
RIDDIM - Riddim Guitar "The man with the meanest quiff in showbiz, he's only got three chords but he knows the truth, plays guitar like he was-a ringin'-a-bell"
STIX - Drums "The man who brings the beat, he gets you out of your seat and on your feet"